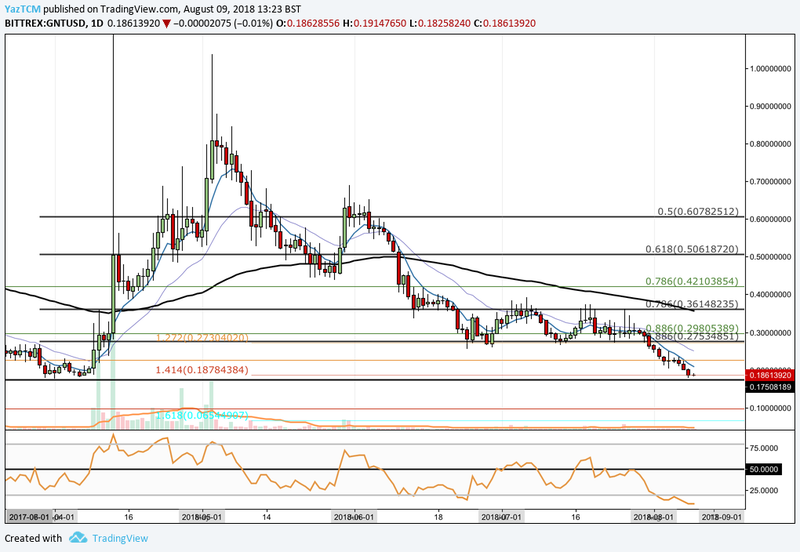 Golem Price Analysis: GNT Trading At Long-Term Pivotal Support Level -- Can the Bulls Reverse Price Action From Here? 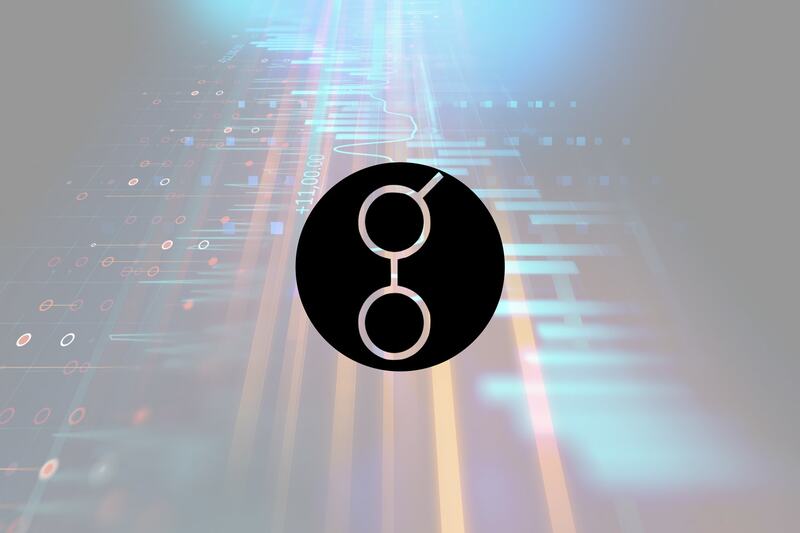 Golem Price Analysis: GNT Trading At Long-Term Pivotal Support Level — Can the Bulls Reverse Price Action From Here? Golem has seen a 2.14% price decline over the past 24 hours of trading. The ERC-20 cryptocurrency is currently exchanging hands at $0.1892 and, like the majority of the cryptocurrency market, has suffered a steep 23.84% price drop over the past 7 trading days. Golem was created in 2016 by Polish founder Julian Zawitowski, and aims to become a decentralized supercomputer. The supercomputer would use the technology of combined computing power, rented out from users across the entire Golem network. Users of the network can then come and rent this spare computing power for CPU-hungry tasks such as CGI rendering or scientific calculations. This renting of spare CPU power and resources has led many to label Golem as the AirBnb of computing power. The Golem team has released their proof-of-concept product known as Golem Brass onto the Ethereum mainnet in April. Golem Brass allows users to rent out computing power from the Golem network in order to assist with rendering tasks on the application Blender. For more information on Golem, we recommend reading our “What is Golem” guide. The 21-month old coin, GNT, is currently ranked 46th in terms of overall market cap across the entire industry. It currently has a market cap value totaling $181 million, and has significant losses to regain as the cryptocurrency fell by 65% over the past 90 trading days. 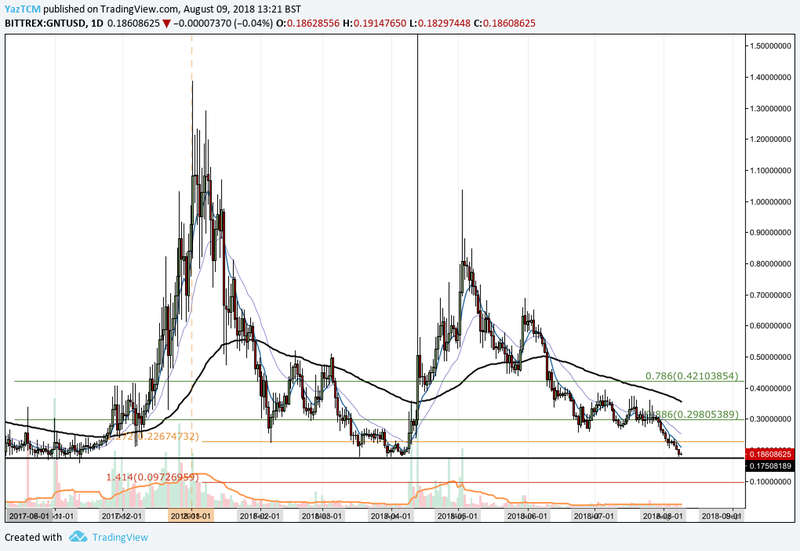 Let us continue to analyze price action over the long run for Golem. Analzsing the market from a long-term perspective, we can see that Golem had experienced a significant bullish run toward the end of 2017. In this bullish run, price action started from a low of $0.15 on November 12, 2017 and extended to a high of $1.38 placed on January 2, 2018. This was a price increase totaling 725% from low to high. We can see that the market rolled over after placing this high, and initially fell to find support at the 100-day moving average in January 2018. However, we can see that price action was not able to sustain this level and continued to fall until support was found at the long-term .886 Fibonacci Retracement, priced at $0.2980 during February 2018. This is a Fibonacci Retracement measured from the entire bullish run outlined above. As the month of March began to trade, we can see that the market had found brief support at a downside 1.272 Fibonacci Extension level priced at $0.2267, before sliding further lower and finding support at a long-term support level (marked by the thick horizontal black line) priced at $0.17. This price level turned out to be a pivotal level of support that was aggressively defended by the bulls within the market. We can see that, after being rejected by this price level, the market went on to rally, creating another bullish run in April. It is important to highlight a significant price spike witnessed on April 13, 2018. On this day, price action had briefly increased by a total of 300% as the market quickly rallied toward placing an all-time high priced at $1.88. However, the market was not able to sustain itself at this peak, and swiftly returned to its previous equilibrium level of trading. This price increase was caused by the Golem team launching their beta product, Golem Brass, on the Ethereum mainnet, which caused a frenzy in buying. We can see that price action is, once again, currently trading at the long term support level priced at $.017. Can the bears continue to fight to keep price action above this level? Let us continue to analyze price action over the short term to highlight any potential support and resistance zones. Analyzing the market from a shorter time frame, we can see that price action had experienced another bullish run during April 2018. In this bull run, price action started from a low of $0.17 on April 1, 2018 and extended to a high of $1.03 witnessed on May 3, 2018. This was a price increase totaling 500% from low to high. We can see that the market started to decline toward the end of May, initially finding support at the short-term .618 Fibonacci Retracement priced at $0.50 which was bolstered by the 100-day moving average. This short-term Fibonacci Retracement is measured from the second bullish run outlined above. Price action continued to fall further lower in June, finding support at the short-term .886 Fibonacci Retracement priced at $0.27. The support at this short term Fibonacci Retracement was bolstered by a downside 1.272 Fibonacci Extension level in the same price area. We can see that for the rest of June and the majority of July, this level provided significant support throughout the period. During August, the market has continued to fall lower to where it is currently trading, at the downside 1.414 Fibonacci Extension level priced at $0.18. The market has now completed a 100% retracement from the bullish run experienced during April 2018 as it trades very close the $0.17 initial starting handle. We expect the bulls to heavily defend this price low — however, with the capitulation occurring within the entire cryptocurrency industry, anything is possible, especially if Bitcoin continues to plummet lower. In the case that the bears push price action below $0.17, we expect immediate support to be located at the psychological round number handle of $0.1. This area of support is reinforced by a long-term downside 1.414 Fibonacci Extension priced in the same area. urther resistance above this level is expected at the .786 Fibonacci Retracement priced at $0.36. This area of resistance is also reinforced by the 100-day moving average which is currently hovering slightly below this price level. The technical indicators within the market are heavily favoring the bears at this moment in time. The RSI is trading at extreme oversold conditions below the 20 handle. For a sign that the bearish momentum is beginning to fade, we will be looking for the RSI to make its way back toward the 50 handle. A sustained break above the 50 handle would indicate that the bulls are starting to gather momentum within the market.